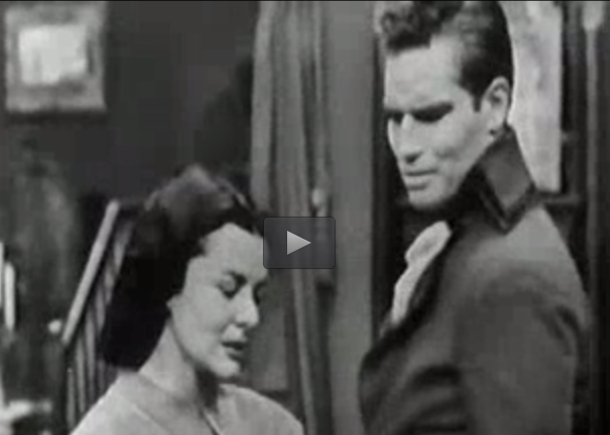 This hour-long adaptation was part of the "Studio One" TV series, sponsored by Westinghouse, which ran from 1947-1958. Within that hour, the producers had to squeeze not only a full production of Jane Eyre, but also several Westinghouse commercials. Hence, drastic plot shortcuts were necessary. Jane endures childhood misery at Gateshead. Jane spends eight years as a student and teacher at Lowood. Jane gets to know Thornfield and its inhabitants. Jane returns to Gateshead and settles matters with the Reeds. Jane's feelings grow; Rochester proposes; they plan to marry. Fleeing Thornfield after the wedding is stopped, Jane suffers and is rescued by the Rivers family. Jane teaches school and is pursued by St. John. Jane returns to Mr. Rochester and marries him. The condensed 1949 film skips 1 and 2, hurries through 3, skips 4, makes a mad dash through 5, skips most of 6 and all of 7, and arrives suddenly at 8. "What's left can hardly be Jane Eyre," one might think. Despite these severe cuts, though, the movie actually entertains while providing a reasonably Brontë-esque feel. Action starts with the the grown-up Jane (age 20, not 18 as in the book) leaving Lowood while being excoriated by the nasty Miss Scatcherd. Jane's retorts fill the viewer in on the rudiments of her earlier years. "For what am I supposed to be grateful? For the years of humiliation? I pity the wretched trusting children that pass through this gate into your merciless hands. ... Well, I was one of those children. ... It's true, I have no family or friends. But God gave me spirit, which even Lowood School wasn't able to quench." Having bid that wretched place goodbye, Jane arrives at Thornfield a scant three minutes into the film! While she loves the manor instantly, viewers are warned that not all is right. Mrs. Fairfax tells Jane, "Like all old houses, Thornfield sometimes has strange stirrings at night"; immediately, foreboding music swells. That type of heavy-handed dramatic touch is typical of this production (and of other films of that era). What it lacks in subtlety, though, it often makes up in professionalism. Shots are well composed, and the actors play their roles admirably. Mrs. Fairfax and Adele are both fully believable. Mr. Mason and his solicitor, Briggs, look and act as one imagines a successful trader and lawyer would. We spend little time with Blanche Ingram and her mother, but they fit in well too (although Blanche is presented as less ostentatiously glamorous than usual). Charlton Heston is an impressive Rochester. While he doesn't resemble Brontë's broad-shouldered blacksmith, he oozes with gravitas in a way matched only by Orson Welles among Rochester's film portrayers. The viewer is well aware that he is acting, but he doesn't chew the scenery as voraciously as Welles did. Unfortunately, this abridged version allows him few tender moments, making it hard to see why Jane falls for such a stern and often tempestuous master. Meanwhile, Mary Sinclair — the first actress to sign a long-term contract with a TV studio — does well enough in her curtailed role as Jane. We mainly get to see her being happy at Thornfield, jealous of Rochester's attention toward Blanche, overjoyed to accept his proposal, and devastated when the wedding is interrupted. She doesn't get to display much of Jane's calm resolve or her gradually developing emotions. Within the scenes covered by this shortened production, significant changes are made, perhaps for the sake of simplicity and time. For example, Jane and Rochester are being wed at Thornfield [rather than a church], while Bertha gapes at them from her window. The extended high-society gathering at Thornfield is replaced by a simple visit from Blanche and Lady Ingram. After fleeing from Thornfield, Jane is alone in a windswept setting, where she hears Rochester's voice (we don't know how much time has passed). And so on. As the film ends, they are together again, but we don't learn of their subsequent marriage or parenthood. To their credit, the writers included a lot of Bronte's dialog — some verbatim, some shortened but still recognizable. It's so nice to hear Rochester say that Jane must have been "tenacious of life" to have survived so long at Lowood, or to hear his voice catch when he tells her "Goodnight, my ...."
P.S. The quaint Westinghouse ads provide great comic relief to this emotionally heavy tale. In the first, showing an electric range, the pitchwoman enthuses, "Your children and your husband will boast about your cooking when you own a Westinghouse." What a blast from the past!